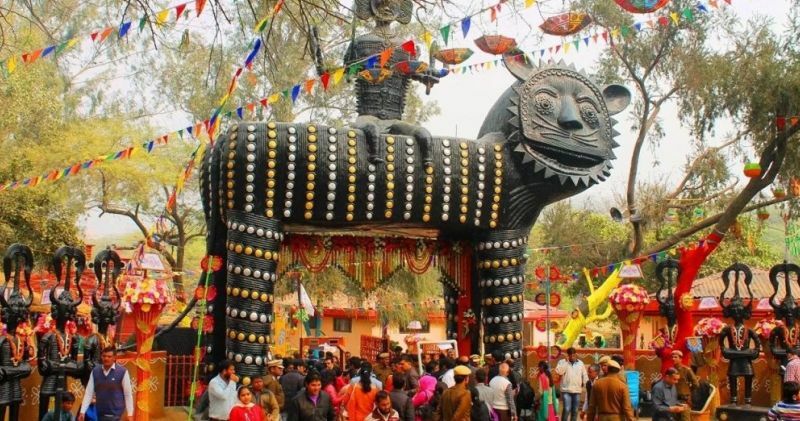 The name "Surajkund Mela" named because of "Surajkund" area, Surajkund is the location which is situated in Faridabad Haryana, which is 8 km far from South Delhi. Surajkund Mela is famous for handmade crafts of different-different Indian states. This Mela always organized by Haryana Tourism Department every year in the month of February for the first fifteen days. The beauty of this Craft Mela is the originality of Indian culture which creates a rural ambiance, which attracts tourist. Surajkund Crafts Mela that showcases the authentic flavors & fragrances of rich Indian cuisines. It become International Craft Mela, where crafts-person of other countries, shows their crafts, where buyer directly reach to seller, where stone and wood carvers, metal workers, folk painters, embroidery, tie-dye crafts-persons, textiles printers, lace makers, producers of silk fabrics, carpet and loom weavers, sculptors and jewelers execute and display their Crafts Skills. Complete showcase of Rural Ambience. Hand Made Crafts like Painting, carpentry. Finest handicraft and handloom traditions of the country. Near to Badkal Lake, Aravalli hills. Open-air theater called Natyashala or chaupal is very popular among the people, where folk cultures or dances are performed by artists. Date: 1st February, 2019 to 17th February, 2019. Entry: By Ticket (Rs-70 for adult), you can get it from ticket counter at mela complex or by online (Website:www.haryanatourism.gov.in) with 10% discount. Transportation facilities are very good by the Haryana Transport during Period of Mela. You can reach there by Air, Rail, Road, Metro. Rail: Nearest Railway Station "Faridabad" and "New Delhi". Road: Old Faridabad Chowk (Rajiv Chowk) or Badkal Mod Chowk which is 12 km far from Badarpur (Delhi-Haryana Boder). Metro: NHPC Metro Station via 'Badarpur Metro Station'.